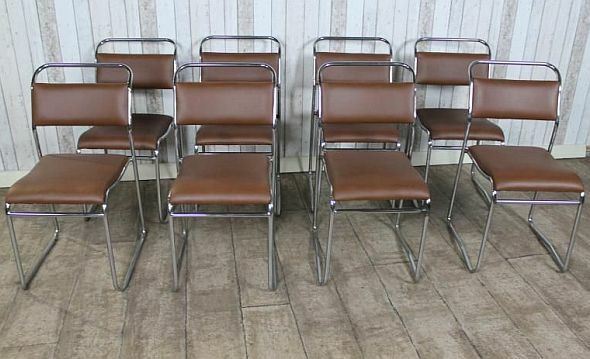 CHROME STACKING CHAIRS, RARE SET OF 8 CHROME STACKING CHAIRS WITH RE..
A very rare and impressive set of eight Cox chrome stacking chairs dating from the mid twentieth century. The chairs have been recently upholstered in a brown faux leather material, and are in excellent condition for their age. They would make a fabulous feature in any studio apartment, or contemporary interior. An very versatile chair, these vintage Cox stacking chairs are rarely seen with a chrome finish. This listing is for the complete set of 8. Sorry these are now sold, please look at our other listings of chairs for similar items.